I wore my hair in a full head of braids for 10 years, but switched to hidden rows of "pinch braid" style braids using wavy Plasikhaar when I had my son and lost a lot of hair thickness (and time!). The braids have to be 3" long or they slip out of my fine hair. But that means they also often show through my ultra fine hair. I have a couple long braids at the top to make the braids look more intentional, but facing monthly redos of all the braids, I'm wondering if buying clip-ins would be better? I've never purchased human hair anything and am scared of the cost. But I'll get a hh set if that is what is best. Can synthetic work out as clip-ins? I currently use a low-heat iron on my hair, mostly avoiding the extensions, but I do have kanekalon streaks in there and have flat ironed them accidentally without problems. I lighten my blonde hair to match 613, though the undersides tend to have streaks that match 22. My hair has a slight wave that I usually straighten out. It is collarbone-length at its longest, with shorter top layers and bangs that are lip-length. I'd like to end up with something similar to what I have now... 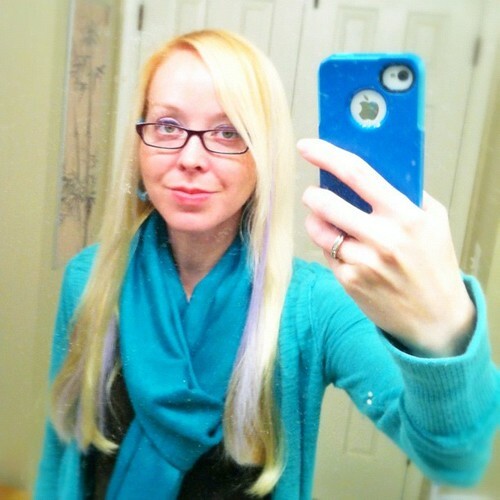 Minus the lavender streaks since I can add those separately. Does anyone have suggestions for clip-in for fine hair? If you want to wear them often, human hair is way easier to keep nice. I have super fine hair too, and I use the Fashion Source brand we carry. This is a video of Doc installing a set of them on me! Human hair probably will be best, if the clips show, you can backcomb those sections above the clips, and a bit before you clip them in as well. My hair is fairly fine, and that's what I do synth can be used for clip ins, it won't look quite as natural and will need replacing more often, but it's cheaper if you just wanted to experiment! Thanks for both of the replies! Still thinking about what I want to do. I'm about ready to just dread it! One important point to remember with fine hair and clip- ins; use very small clip combs. The use of heavy medium to large clip combs weigh fine hair down and will result in breakage. application is also important: clip in extension spritz on holding spray to avoid slipping and constant handling and spritz with water to loosen when removing them. I have fine hair and its really soft as well. The thing with clip ins and fine hair, is you have to be mindful of the weight. Some companies offer a deluxe set of clip ins, where the amount of hair on each track is almost twice what it usually would be, and personally I wouldn't buy that. The heavier a track is the more it will slide off your hair. I had this problem big time, and is the reason I couldnt wear clip ins anymore. Also teasing is very important when you have fine hair because this helps guarantee that they wont slip. But to answer your initial question. Human hair. The synthetic will not last nearly as long as the human hair would, and that gets frustrating! Another tip with clip ins, is try to avoid washing them. Sounds crazy I know, but hear me out. Before being packaged the hair is covered with a layer of silicone to feel soft. As soon as you wash them the layer comes off. After this they become matted easily and start to become unusable (over a period of time of course). You should consider having wefts but not clip ins. If it is human hair you can have like 4~5 horizontal cornroaw in small distnace (while leaving a lot of your own hair out of the braid) and have the weft stitched to it. You won't have to clip-in and out the wefts... you won't have to deal with clips attached to the same spot all the time and the weft will be holded all from one side to another (not in 3~4 clips only). If you have used plastikhaar and you are ok with them then you can very easily ask someone to make you a weft out of this hair. Then either use it with clips or have it permanently with weft sew-in.